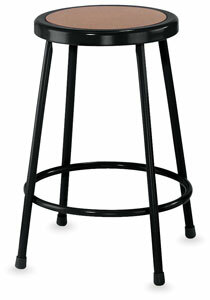 Quality, durability, and style are the standards for this superior stool. Its seam-welded, 18-gauge steel frame and enamel finish with polyethylene feet stand up to lots of use. The seat is a full 14" in diameter, with an 8-rivet attachment system that helps prevent warping — double the number of rivets found on most other stools. 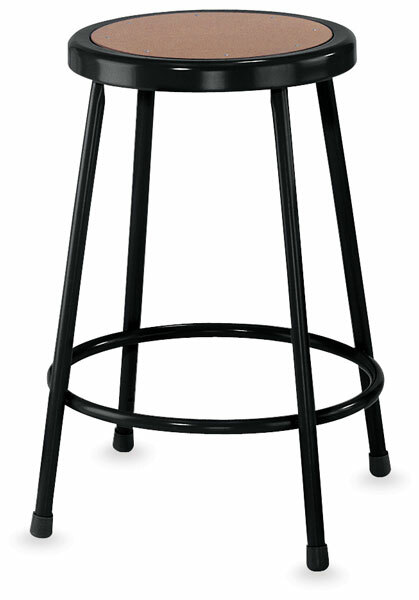 A footring is welded to each leg, giving the stool the added strength to withstand the daily abuse that stools receive in a classroom or studio environment. Choose from the plain model or the stool with a backrest. The backrest, measuring 6" H × 12" W, adjusts up and down or forward and back. The backrest model also features chrome plated inserts and tilt swivel glides.